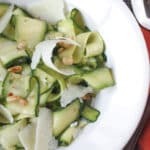 Fresh zucchini shaved into ribbons creates the base for this light and flavorful Zucchini Ribbon Salad. 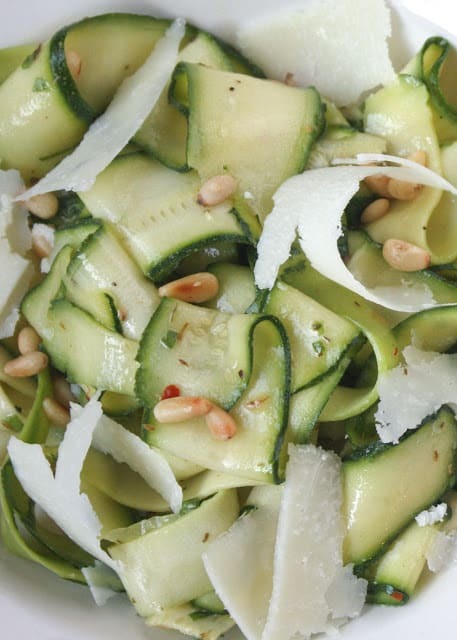 If you’ve never tried raw zucchini, you might be surprised by just how delicious it is. The first time I made this, I had no idea what to expect from the raw zucchini and it turned out even better than I would have thought possible. Over the past four years, this salad has made repeat appearances with our summer meals. I’ve served the Zucchini Ribbon Salad with Pan Fried Southwest Chicken, Herb Rubbed Pork Roast, and Simple Broiled Salmon. This is a go-to side dish and it’s a great way to make the most of an abundance of summer squash! If you’re looking for more ways to use your abundance of summer squash, try these Spicy Squash Refrigerator Pickles. Pickled Squash is a crisp and refreshing snack and I love the spicy kick too. 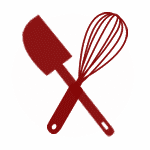 Using a vegetable peeler, working from the top to the bottom of the zucchinis, slice the zucchini into ribbons. Shave the zucchini until you reach the seeded interior and then discard the zucchini centers. 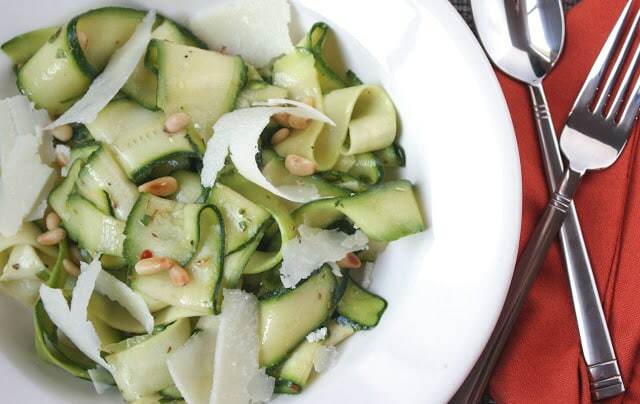 Set the shaved zucchini in a bowl. Add the basil and the pine nuts. Drizzle the salad with salad dressing. Toss gently to coat. Top with Pecorino Romano cheese right before serving. I'd pair this with a pinot gris. I still haven't tried your zucchini ribbons yet. I will get to it sometime. Haven't been home enough to cook much. What a beautiful looking salad. Looks like it would light and tasty! A healthy and tasty ribbon salad! Looks good, I find it helps if you salt the zucchini first and let it drain in a colander for 30 minutes or so to draw out the moisture. Then you can rinse it off and it is almost more like pasta. Such a beautiful, easy way to enjoy the season's best zucchini!